Looking to add curb appeal to your Richmond home? There are lots of projects you can do to make your home stand out and boost your curb appeal. In this blog we’ll cover a few projects to consider this summer. One of the simplest ways to increase your home’s curb appeal is with landscaping. The tasteful arrangement of shrubbery, plants, trees, and gardens, is an easy and fun way to draw attention to your home. Hardscaping is another great way to direct attention to your home. Patios might usually be thought of as a backyard affair, but they work just as well out front too, where they’re not hidden from view. Walkways and stone and paver arrangements can create engaging lines that draw the eye up to the front of the house naturally. Improvements you make for the sake of curb appeal are all well and good during the day, but what about at night when they can’t be seen? Shine a light on your home with elegant outdoor lighting. Not only can outdoor lighting be used to show off your home at night, it also serves as a security measure and deterrent. A fence is the first thing that meets someone at the curb of your home, and can be used to great effect to increase curb appeal. 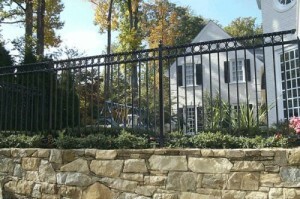 You can create many different looks with a fence, from classic and rustic to elegant and ornate. Hercules Fence of Richmond can help you find the perfect fence for your home and the aesthetic you want to achieve. This entry was posted on Thursday, June 12th, 2014 at 4:34 pm. Both comments and pings are currently closed.